Concealed and open carry is not only your constitutional right, but it’s also a problem if the holster is not satisfying. Glock is one of the favorite choices for the personal defense today; there are a lot of holsters made for it. This issue is not solved that hard as it was years back when people used to look at Glock with skepticism. Once it gained the trust of the gun enthusiasts, numerous holsters began to emerge. Today we’re going to look at some of them and choose the best holsters for Glock 43 we can find. 2 Why Should You Own a Holster in the First Place? 4 What Makes a Holster Really Great? The common problems which can be caused by bad holsters are discomfort, delayed draw or even the loss of the gun. A quality holster should hold the gun tight and offer the possibility of quick draw at the same time. It should be durable and made of quality materials, the ones for concealed carry should be comfortable enough to carry it through the entire day. How will you wear it and where? Is it for work or self-defense only? Will you modify the Glock with attachments? Once you got that straighten up, think about the material. The leather holsters are the slowest to break in, but the most comfortable ones. Other various options offer the protection from corrosion, quick draw mechanisms and tight securing. The next important thing, is, of course, the price. Usually, a good quality holsters go from 50 to 100 bucks. Doesn’t always has to be the case, but most of the time if the holster is below the $50 price tag, it’s most likely going to be a low-quality product. The value of the holster is easily calculated; try to find the average number of times the holster was used by other people before it was broken. Divine the price with that number, and you will see how much will you pay for each use of the holster. Pay attention to the trigger of the gun and the holster. Nothing should touch the trigger or get in its way while drawing the gun. Why Should You Own a Holster in the First Place? The main purpose of holsters is to protect and hold the gun in place, to prevent discharge, to provide quick draw and to prevent the loss of the weapon and even theft. To keep yourself and others safe from accidental firing, to preserve your gun from corrosion and to securely conceal it, you will need a holster. Most of the belt holsters are used for open carry since they are a bit harder to conceal and they require a belt to be secured on. The primary uses for belt holsters are filed use, competitions and for shooting range. To work properly, these holsters require a gun belt. They are secured with single or double clips or double or single straps. They can come with J-hooks as well, to keep the holster in place while drawing. Designed to be worn on the opposite side of your shooting hand, so you have to reach across your body to draw the gun. Look out for these if you want to wear the Glock in your front or back pocket. They are designed, so they fit right in the pocket and are usually small in dimensions. If carrying a Glock around your ankle is your thing, then these might be the right for you. They are mostly secured with a strap, and their placement is on the side of your firing arm. Capable of horizontal and vertical positioning on the shoulder. These were very popular amongst professionals back in the day. They offer an easy approach, and they conceal under the coat pretty well. What Makes a Holster Really Great? Now, let’s get into details about these requirements. It’s important to state that a lot of holsters available have no coverage of the trigger at all, or it’s covered with a poor quality material. Avoid these at any cost. The trigger has to be completely covered with the sturdy material to ensure the safety. Kydex or leather are the materials which will do a great job. Kydex is the material similar to the polymer; the difference is that it can be shaped to fit the gun like a glove. The gun has to stay in its place if the holster can’t hold it in place while you turn it upside down, then it doesn’t fulfill its basic purpose. The holster has to hold the gun in place strong enough to prevent any unintentional displacement. If you want to carry it openly, then this point won’t matter to you. The best level of concealment can be achieved with IWB holsters. Of course, not everyone can use the same type since what is right for one person, may not be right for you. The difference in body types and your way of handling the gun, play a big role here. The holster has to protect both you and your gun. The harder the material, the better protection, but, hard materials can cause rub marks to appear on the holsters surface over time. There’s also the matter of comfort, hard materials can rub your skin while you walk, and the metal clips can damage your pants. Your holster has to provide you with the ability to have a good grip once you draw the gun. The ability to draw and fire from any position has to be achieved if not; it’s time for a different holster. 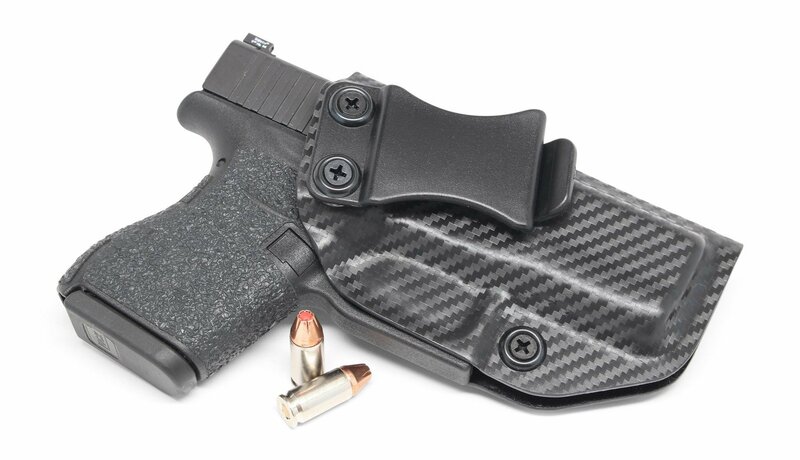 The concealment of this IWB holster is great; it makes a proper daily driver. It can be adjusted and positioned wherever you want it to be with its 0-15 degrees rotation ability. The retention is adjustable, and it provides the maximum security of the gun. It attaches to the belt with a belt clip and it is very light to carry. The material used to make one of these is KYDEX, so the holster is rigid, and quality build. The holster features sweat shield, meaning your gun will be kept dry at all times. There’s a posi-click function which is great to let you know is the gun secured in its place. The warranty it comes with is a lifetime one, considering the holster is USA-made. It comes in two designs, black and carbon fiber; the carbon fiber gives it a shiny look. The gun slips easily in and out; it clicks in while securing it, so there’s no worry of it falling out. The bad thing about it is that the shirt can get sometimes stuck under the clip. Some may even find it a bit uncomfortable due to its hard material. 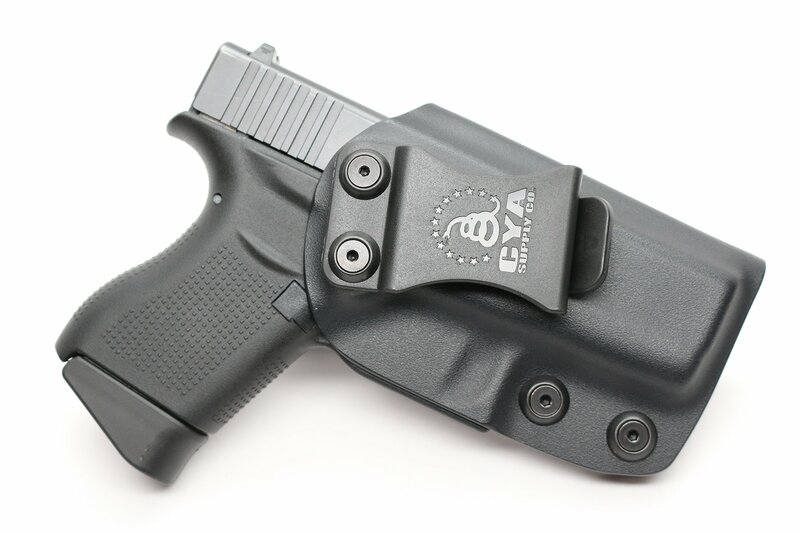 This brand is considered the best in the production of IWB holsters. This version fits only Glock 43 and is especially designed for it. It’s made of Boltaron thermoplastic which is a kind of KYDEX material which is more resistant and harder in build, making it resistant to chemicals and scratches. This material is very resistant to high temperatures. The holster can be adjusted to an angle from 0 to 15 degrees. It proved to have much less friction while drawing and re-holstering the gun. It features the posi-click retention lock system, and the sweat guard covers the entire length of the slide. The screws are adjustable, and they can be set to your own preference. The belt clip is made of stainless steel, and it’s 1.5” wide only. You can choose from four different color options just so if you like. The price tag was recently cut significantly, making it pretty affordable holster right now. It’s made in the USA, and it comes with a lifetime warranty and 100% return policy. Lirisy is designed to fit a lot of different firearms. It’s a bit bigger in dimensions so it can fit as much as different guns as possible. The holster is pretty durable since it’s made of neoprene with a steel clip. It’s available both in left and right-hand variants. The material is very thin, making the holster extremely comfortable, the only downside is that it a bit longer than the previous ones we covered, but the good thing about it is that you can use it for nine versions of Glocks if you own more than one. To keep the gun secure a snap button is there to make sure of it, not the favorite solution of them all, but most secure one for sure. The wear and tear are prevented with sturdy nylon which is used to cover the outside of the holster. All these materials combined make the Lirisy holster very flexible and extremely comfortable to wear inside of the pants. The last and the best good thing about this one is its price; it’s very low priced and affordable to anyone. The good thing about this one is that it’s designed to fit everyone, all body shapes for man and women. It comes in two variants, for left and right-hand shooters with a compartment for a spare clip beside the gun. It’s made of neoprene making it very stretchy and adjustable. 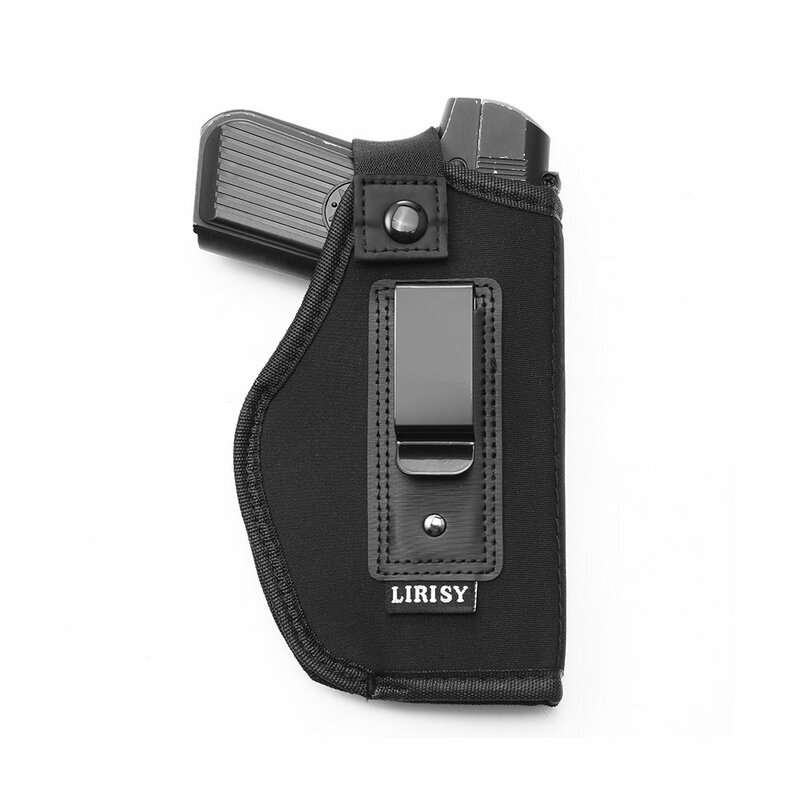 The elasticity of the holster is top notch, giving you the option to wear it both inside and outside. The ComfortTac holster can hold a variety of guns and in numerous different positions. It’s the most versatile pick so far. The retention strap is there to keep the gun in place, which can be cut off if you prefer the quick draw over the retention support. Have in mind that even with its high elasticity, it may not fit every waist size. It also may seem a bit bulky under the clothes. The comfort is ensured, which is why this holster is particularly loved by the ladies. Maybe the best balance between the price and the quality is this one right here. 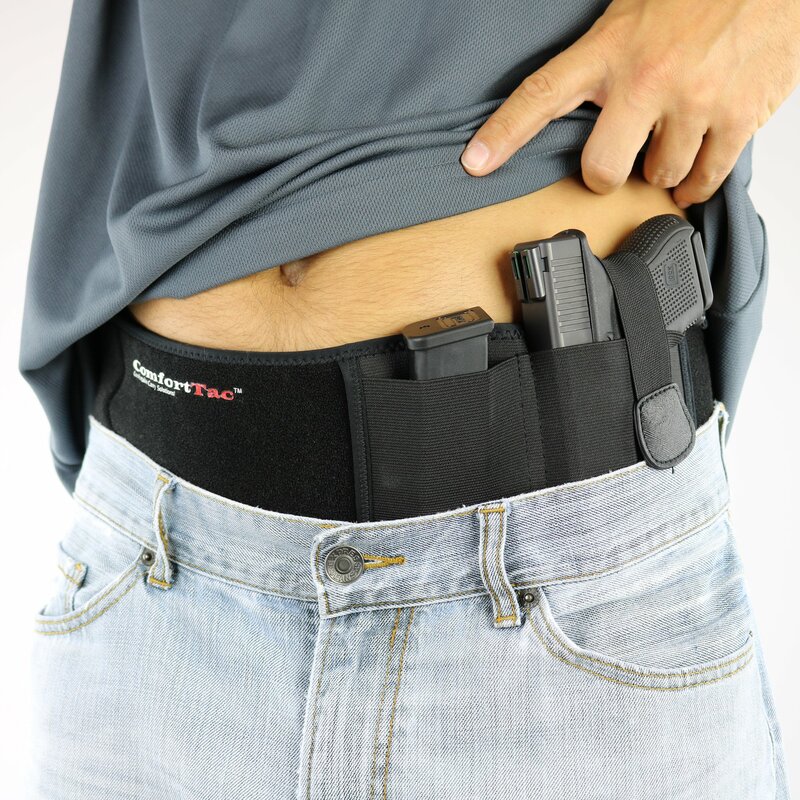 It’s made to be used as an inside pants holster only; it cannot be used for open carry. It’s available in right hand and left-hand variants. 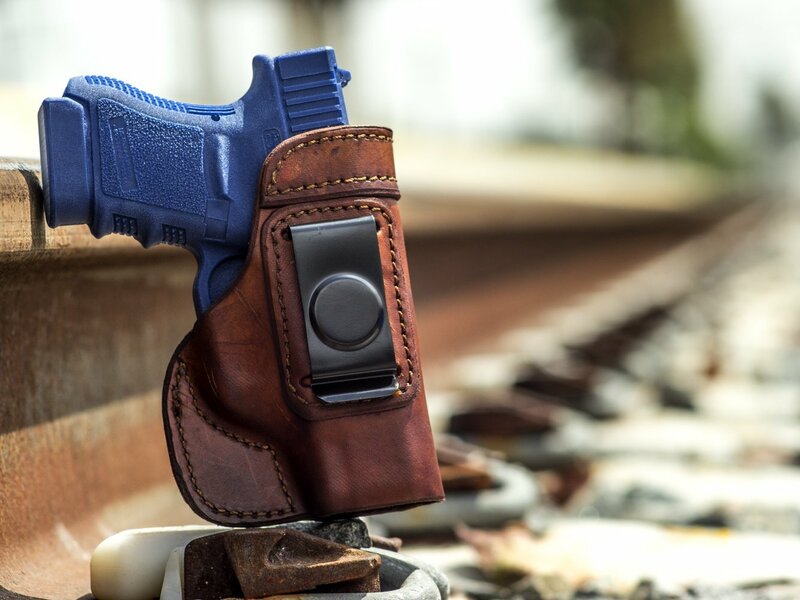 The entire holster is handmade from the genuine leather used to the dying process. It has that old school look that it’s a synonym for quality. It is custom shaped and hardened to fit the Glock 43 perfectly. It is a bit stiff at the beginning, until the leather breaks in, which is normal. Because the natural leather is used, the holster is very comfortable to wear inside the pants. The position of the clip is just right, the gin does not go all the way down, and it stays at the level of your waistline. It goes over the trigger which is important, and the clip holds it in place very firmly. Our 5 picks for the best holster for Glock 43 are unique and most importantly safe for people who regularly carry arms along with themselves wherever they go. Considering all the requirements, one holster should have, and by the personal experience with it, it’s in order to proclaim the winner of the few picked pieces in this review. And by everything taken into consideration, Concealment Express IWB KYDEX Holster is a clear winner. It’s crafted looks are amazing, especially the carbon fiber option. The trigger guard is present with the awesome posi-click system which makes the holster secure and quick-draw capable. I like the way IWB holsters look but are they difficult to sit with? The positioning looks uncomfortable for sitting compared to a standard holster on the side that’s out of the way.